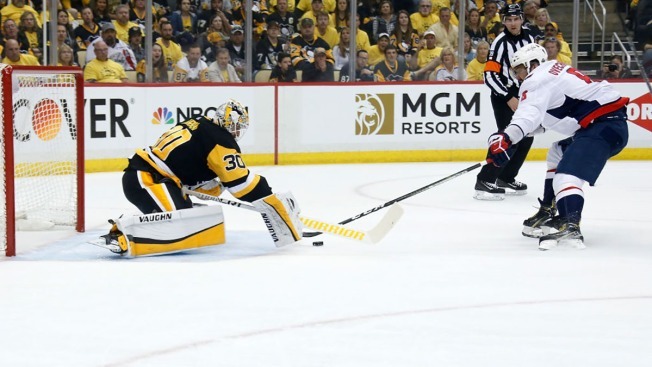 The Capitals won 4-3 against the Penguins, gaining an edge in Game 3 of the series after a Alex Ovechkin scored a tie-breaking goal with less than two minutes left in regulation. Having home ice is supposed to be an advantage in the NHL. So far in the 2018 playoffs, the only guarantee to playing at home is a monochrome backdrop provided by fans in team-specific T-shirts. The Pittsburgh Penguins finished with the second-worst road record among the 16 playoff teams. Then the two-time defending Stanley Cup champions ripped off three wins in Philadelphia to kickstart their pursuit of a three-peat and backed it up with another victory in Game 1 of their Eastern Conference semifinal series in Washington. The Capitals dropped Games 1 and 2 at home in overtime against Columbus in the opening round only to beat the Blue Jackets three times in Columbus on their way to advancing to the NHL's final eight for the fourth consecutive year. Winnipeg posted an NHL-high 32 wins on home ice. One of their seven regulation home losses, however, was a wild 6-5 setback at the hands of Nashville in February. The Predators' triumph helped them win the Presidents Trophy and guarantee home ice through the playoffs. The Jets, of course, won the series opener in Nashville to steal that advantage. Asked why the games have become a coin flip regardless of venue, Penguins coach Mike Sullivan -- whose team was outplayed at PPG Paints Arena by Philadelphia in Game 2 and Game 5 in the opening round -- admits he can't really come up with a reason. "I don't know if I have answer for you that makes sense," Sullivan said Monday. "Sometimes when teams go on the road, they have tendency to simplify their game ... I know our team historically has been very good at home and I believe we will continue to do that." If Pittsburgh wants to become the first franchise in 35 years to win three straight titles, it doesn't really have much of a choice. Though Sullivan is right in that the Penguins are pretty good at PPG Paints Arena, they've only been so-so when facing the Capitals. Washington won Game 3 and Game 6 in Pittsburgh during the 2017 postseason and wrapped up its third straight Metropolitan Division title with a 3-1 win there on April 1. "You've got to create your own momentum, but it gives you good memories," Capitals coach Barry Trotz said. "If you have to go back into the memory bank, at least we have one. Those are things that you can bank on maybe for some positive feeling going forward." Predators forward Nick Bonino couldn't offer up any specifics about Nashville's victory in Winnipeg even though it happened all of two months ago, saying only "I'm sure we played a solid road game." The road does offer the visiting team a sense of routine. There aren't as many friends or family around. No kids waking up in the middle of the night. No traffic to deal with in most places. Just wake up, suit up and go play. "You go out to dinner, there's not really any distractions," Bonino said. "You're there for hockey." That chippiness included a questionable hit by Washington's Tom Wilson to Pittsburgh defenseman Brian Dumolin's head in the second period that sent Dumolin into the concussion protocol. Dumolin skated with his teammates on Monday and his status -- much like the status of star center Evgeni Malkin (lower body) and Carl Hagelin (upper body) -- won't be determined until Tuesday. Wilson was not penalized for the hit and received a pass from the league when it opted not to schedule a disciplinary hearing to review the play. While Dumolin said he didn't see Wilson coming because he was bracing for a hit by Alex Ovechkin, Wilson claimed Dumolin turned his head just before impact leaving Wilson with no time to react. "He stops and turns and I'm kind of right there as (Ovechkin) is coming in pretty aggressively," Wilson said. "It's a collision." Pittsburgh star Kris Letang wasn't surprised Wilson's hit wasn't deemed illegal. Why? "Because we don't know anymore (what's legal and illegal)," he said. And we don't know what a given night is going to bring anymore either. Home teams get to sleep in their beds. They get the luxury of the last line change before faceoffs, allowing them to get the matchups they want. And so far it has made zero difference in the result. "It doesn't have to be pretty always on the road," Predators defenseman Matt Irwin said. "I think we embrace that."